Cape Breton Tourism Spotlight: Don't Miss Leona Burkey and Chloe Albert In Concert. Don't Miss Leona Burkey and Chloe Albert In Concert. 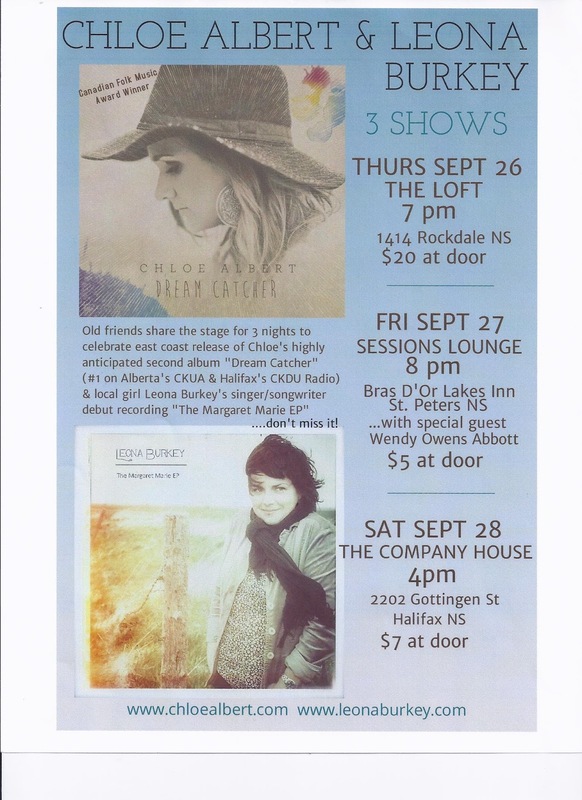 Popular Richmond County Native Leona Burkey Performs with Chloe Albert for 2 shows in Richmond County and 1 in Halifax. The 1st show will be on September 26th at The Loft in Rockdale at 7pm with the 2nd show taking place at the Bras d'Or Lakes Inn in St. Peter's on Friday September 27th at 8pm. These two very talented young ladies have been friends since performing a few years ago out West and have come together again to promote Albert's second album "Dream Catcher" and Burkey's debut recording "The Margaret Marie EP". Don't miss the opportunity to take in these two excellent performances. The performers will be joined by special guest Wendy Owens Abbot at the Bras d'Or Lakes Inn on Friday to see a few of her songs including "The Storm"